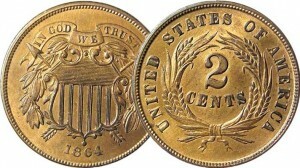 The Two Cent Coin was produced in the United States from 1864–1873 with decreasing mintages throughout that time. Just over 45.5 million were produced. Two-cent pieces were minted in both proof and regular issues. While all two-cent pieces are of the same type, many die varieties exist. The most significant of these are the Small Motto and Large Motto varieties of 1864. The Small Motto is rarer and more valuable. Doubled dies, die cracks and other mint errors are often encountered in this series. In lower grades the first year of issue is an easily obtainable example of the series.